I have always loved being creative. To this day, I can remember being in pre-school and feeling as though the possibilities were endless when I was doing my favorite activity: painting. As I grew older, a lot of that creativity faded away because of pressures from family and peers to pursue careers deemed “safe” or “practical.” For years, I was conflicted on what I was passionate about, and I spent my high school days focused on becoming a biomedical engineer. But during my final semester of high school, I realized that I should pursue a future that I loved. I decided to pursue a creative field, at a school that supported those dreams. The biggest aspect that drew me to ASU was the Herberger Institute. I majored in design studies (design management) because it gave me the opportunity to tailor my degree to my different interests. Through design management, I was able to take classes that ranged from Design Awareness to Essentials of Marketing. I loved the Herberger Institute for the opportunities students had to grow and learn and make their four years as colorful as possible. I was able to get involved in creative student leadership positions like being a Creative Fellow, studying visual communications and media in Singapore, and completing design internships at the Phoenix Art Museum and Local First Arizona. Post college, I wanted to continue my leadership in the arts and design fields. I wanted to be a strong advocate for the creative community in Arizona and help other young adults who struggled to find a career path — just like me. Growing up, I didn’t have anyone in my community to look up to. I didn’t know what a “graphic designer in Arizona” looked like. In April of 2018, the Obama Foundation created the Community Leadership Corps (CLC), because they saw young people hungry to make a change in their communities and needing a platform to get started. CLC was a six-month program designed to train young leaders to create a world they wanted to live in by addressing an issue in their community, and one of the three inaugural cities, in addition to Columbia, South Carolina, and Chicago, was Phoenix. I submitted my CLC application on May 13 and was selected on May 25. There were about 25 teams per city, and each team lead was required to select two more people to be a part of their team. I chose my team members specifically because they both added amazing skill sets to the project and were also passionate about helping young adults in Arizona pursue careers in the creative fields. Darby Vance, a Herberger Institute alum with a background in digital culture, photography and videography, took the lead role for editing our videos. Mischa Aurita, an alum from ASU’s W.P. Carey School of Business who currently works at the Phoenix Children’s Museum as their social media coordinator, created blog content and produced stories on our Instagram. Along with Darby and Mischa, I developed Generation Creative, a digital storytelling campaign that shares the stories of local Arizona creatives to help inspire and empower young adults interested in pursuing careers in creative disciplines. This project grew from our own personal experiences, overcoming familial, peer and societal pressures and the stigmas associated with arts and humanity fields. 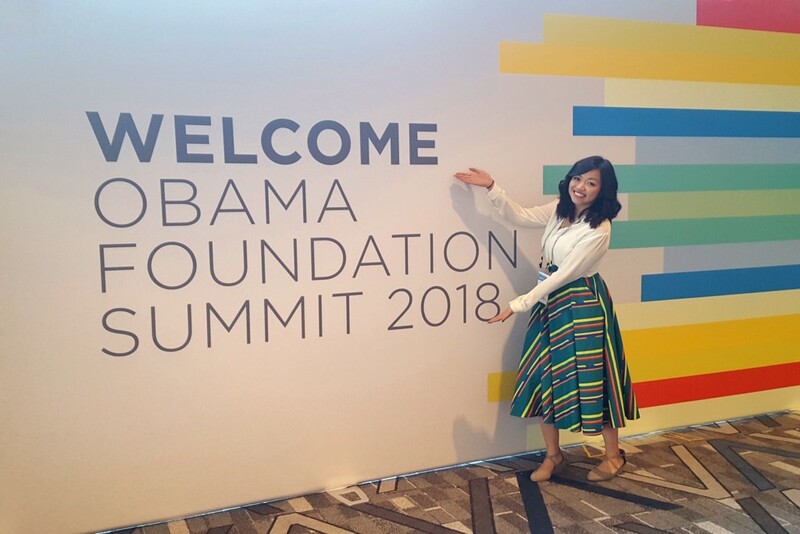 As part of our capstone for our CLC project, the Generation Creative team was invited to the Obama Foundation Summit in Chicago Nov. 17–19. The theme for the summit was “Common Hope. Uncommon Stories,” and the experience was amazing, hearing from leaders from all over the world, of all ages and races, and from different backgrounds. The most impactful moment for me was getting to interview the activist, singer and actress Janelle Monáe. She is an artist who uses her music and her platform to advocate for issues that she cares about like women’s rights and the LGBTQ community. As someone who is a bit of an introvert, it was a huge step forward for me to be a part of such a large movement of young adults wanting to make a change. I was able to speak to Monáe and to thousands of people from all over the world and explain to them my passions, what it means to be a creative in Arizona, and the importance of supporting young adults in their pursuit of creative fields in Arizona. With Generation Creative, we hope to support, motivate and educate both young adults and their parents about the pathway to self-fulfillment through creative outlets. Inspiring a new generation of creatives in Arizona was originally published in ASU Herberger Institute for Design and the Arts on Medium, where people are continuing the conversation by highlighting and responding to this story.